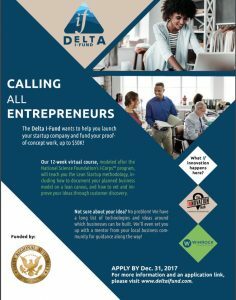 The Delta I-Fund is offering an opportunity for pre-revenue, proof of concept companies at Ole Miss to vet their idea with funding for up to $50,000. The Delta I-Fund is a 12-week program based on the Lean Startup Methodology. The upcoming cohort will begin February 3, 2018. The Delta I-Fund is looking for patent heavy, pre-revenue, idea stage technology startups to apply. The attached flyer has additional information and any questions can be directed to ahopper@arhub.org.